Anymeeples are custom meeples made of laser-cut 9mm thick acrylic. You can purchase them in small quantities! The procedure is very simple. Just pick te size of the smallest square where your anymeeple fits (see list below) and send me your design in a *.CDR file (Corel Draw 12 or less. Other file types will be available soon). The minimum curvature radius is 1 mm. Note: Designs already used in nestorgames cannot be ordered. 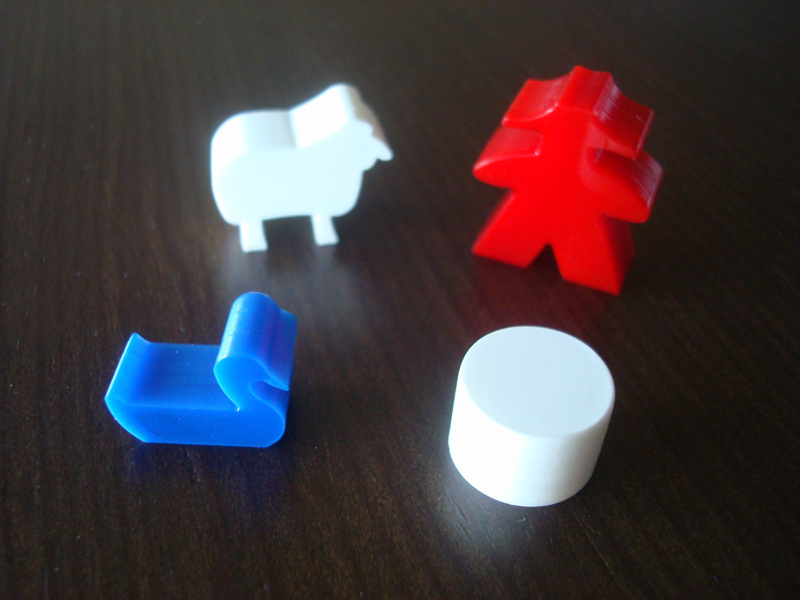 The image below is a sample using meeples from Hello Dolly, Feed the Ducks and Realm. Example 1: If you purchase 15 small red meeples and 15 small blue meeples (1x1 cm) of the same shape for the first time, the total price will be = 10 (template) + 5 (red colour preparation) + 5 (blue colour preparation) + 5 (red set) + 5 (blue set) = 30 Eur. Example 2: If you purchase 60 small green meeples (1x1 cm) of a previous design, the total price will be = 5 (green preparation) + 4 x 5 (4 sets of 15 meeples) = 25 Eur. Example 3: If you purchase 1.500 small anymeeples in 5 colours (300 each), the total price will be: 10 (template) + 5 x 5 (preparation of 5 colours) + 5 x 100 (100 sets) = 535 Eur ( or 0,36 Eur per anymeeple). Available colours: black, white, red, blue, green, yellow, pink. Other colours please ask. If you wish to place an order, please contact me here.